If everything had gone the way it was supposed to go, Bethany Hartung would have awakened this morning ready to graduate with the other 600 Gustavus Adolphus College seniors at 2 p.m.
Gustavus Adolphus College presented Margaret Anderson Kelliher '90 and Paul Peterson '94 with Distinguished Alumni Citations at 5 p.m. Saturday, May 26 at the College's Alumni Banquet as part of the 2007 Reunion Weekend. Russ and Jan Michaletz, members of the Gustavus Adolphus College class of 1974 and residents of Edina, Minn., received the Greater Gustavus Award at 5 p.m. Saturday, May 26 during the Alumni Banquet as part of the College's 2007 Reunion Weekend. Gustavus Adolphus College President Jim Peterson was recently presented a $5,000 check by the HickoryTech Foundation to help fund the College's National Youth Sports Program (NYSP). This summer's NYSP at Gustavus will be a three-week (July 9-28) academic and athletic enrichment program for approximately 150 youth ages 10-16 from low-income families living within a 45-mile radius of St. Peter. At 2 p.m. Sunday, May 27, 595 seniors will receive their bachelor of arts degrees from Gustavus Adolphus College during commencement exercises at Hollingsworth Field. In the case of inclement weather, the ceremonies will be moved indoors to Lund Center for Physical Education and Health. 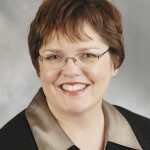 Gustavus Adolphus College Assistant Professor of Religion Thia Cooper has been selected from a national applicant pool to attend one of 27 summer study opportunities supported by the National Endowment for the Humanities (NEH). The NEH is a federal agency that each summer supports seminars and institutes at colleges and universities so that teachers can work in collaboration and study with experts in humanities disciplines. Professor Edmund Kwok, Ph.D., Executive Vice-President of United International College (UIC) in Zhuhai, China, will visit Gustavus Adolphus College on May 20-21. Kwok and his wife Christine will visit six Minnesota private colleges in all as a follow-up to a visit to China in 2005 by a Minnesota Private Colleges Council (MPCC) group that included Gustavus President Jim Peterson. 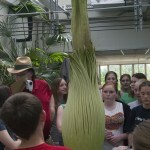 A Titan Arum or Amorphophallus titanum, otherwise known as a Corpse Flower, drew more than 7,000 visitors to the Gustavus Adolphus College Department of Biology's greenhouse during a four day period.